This Rainbow Titanium Quartz sphere is polished to perfection. 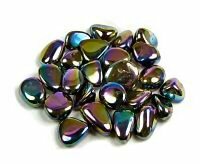 Titanium Quartz Rainbow gemstone is the most powerful and vibrationally intense material of all the coated and treated quartz. 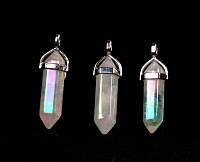 These rainbow colored quartz crystal projects strength, mental sharpness and physical power. These properties are amplified by the quartz base stones. 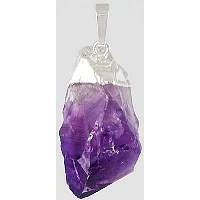 This crystal helps dispell sorrow and replace it with unlimited joy, it can help heal stressful relationships. 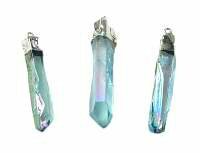 Titanium Quartz is energizing to the entire chakra system, as well as the physical body. Titanium Quartz assists greatly in meditation. Titanium Quartz can be very energizing on all levels, and that it can awaken all seven chakras, the energy centers of the body. It is said to increase zest and enjoyment of life, and to dispel sadness. It also has all the properties of natural quartz crystals; alignment, harmony, etc. 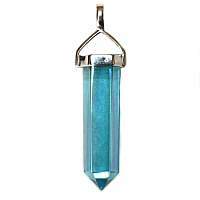 Healing sources say the metaphysical properties of this crystal stimulate the entire endocrine system and is especially useful for reactivating a sluggish immune system. Titanium treated quartz is natural quartz, that has been specially treated in a process much like gold plating. It fuses a molecular layer of titanium plus other metals to the surface of the parent material. The result is a permanent coloring of the surface creating a dazzling effect to the specimen. The many facets of these crystals catch and reflect light in all directions and the iridescent surfaces shimmer and change color as they move and send light in different angles.